happy to announce that our beautiful gold working cocker has reared an exceptional litter of gold Cockers that are now ready for their new forever homes. Dad is a gold kc registered cocker spaniel stud and a copy of his five generation pedigree will be given with each puppy. Mum and Dad have brilliant temperaments and have both been brought up in family homes and socialised with other pets and children. 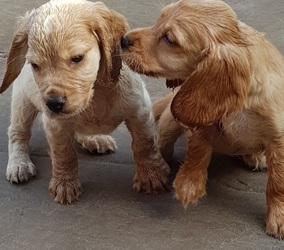 Pups have enjoyed daily interaction with our young children and are all familiar with general household noises that come from a busy family home such as, washing machines, tv, hoover etc. Pups are all confident and enjoy playtime and feedtime. Pups have had their first vaccination, had a health check with our vets and been microchopped ready to be transferred into their new owner's name. Pups have been wormed and flead regularly since 2 weeks of age using alternating products to ensure they are healthy and thriving. Pups will leave with a scented puppy blanket, to make the transition to their new homes as smooth as possible, a copy of Dads 5 generation pedigree and a small amount of food with advice on what to continue feeding. Please get in touch for any more information.